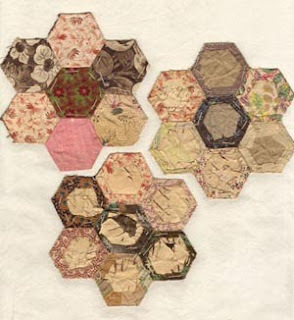 Hexagon patchwork from about 1830 with the papers and the basting still in them. 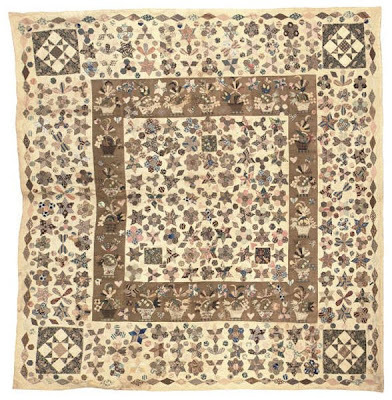 Are quilts with paper templates “quilted”? Are they stitched---quilted through the layers? 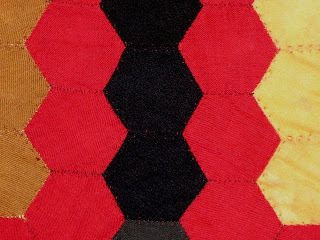 Are they quilted around the pieces? Are they tied or are they just backed and unquilted? It seems they would need to be held together some how especially with the added weight of the paper. I guess some women removed the paper but it seems most I’ve seen are unfinished. 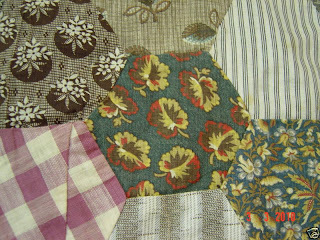 In England, 19th-century quiltmakers (note I didn't say quilters) often left the papers in and they finished off the edges to make what we might call a summer spread---an unquilted top. 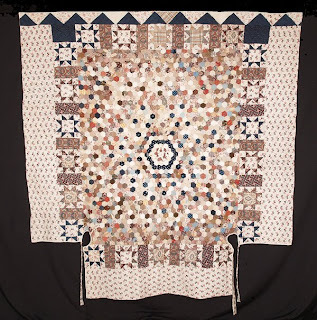 In America, 19th-century quiltmakers sometimes removed the papers and quilted the piece. And sometimes they didn't. 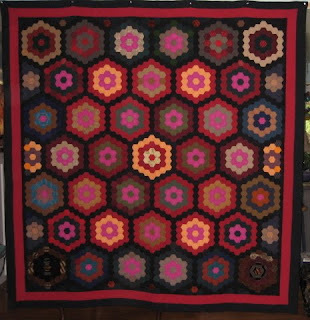 The later in the century, the more likely the hexagon quilts were to have been quilted and to have been pieced with a running stitch rather than to have been pieced over papers with a whip stitch. 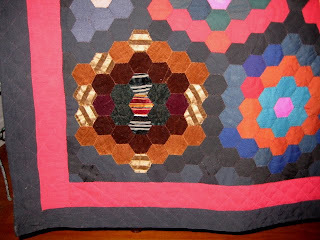 After 1880 or so the idea of using the paper templates behind the hexagons became so-o-o-o-19th-century and most quiltmakers stitched their hexagons together using the standard running stitch without any papers. And quilted or tied them. 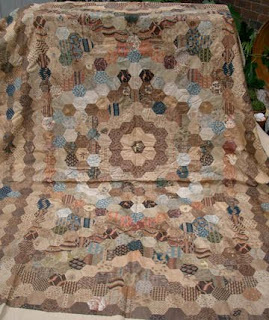 This one from the late 19th century is made of wools, silks, blends, etc. It looks pretty heavy, yet it's quilted close to the seam with a tiny red stitch. 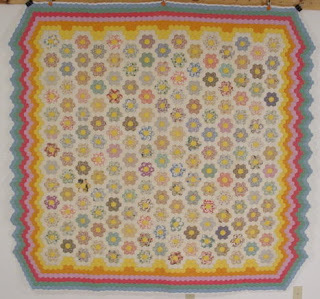 When the hexagon idea became a new fad in the 1930s, nobody used paper and they quilted their Grandmother's Flower Gardens. Grandmother's Flower Garden from the 1930s. 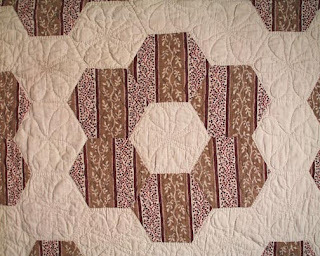 Quilters usually quilted around each hexagon. This British medallion with appliqued rosettes was shown at Houston's Quilt Festival last fall. It's not quilted at all, as far as I can tell. 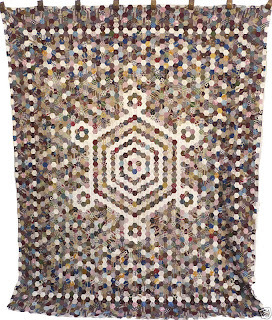 Susi at Susi's Quilts found it online and was inspired to make a reproduction. I had seen it the year before in an online British auction. See more Houston pictures at Virginia Cole's Galloping Pony blog. 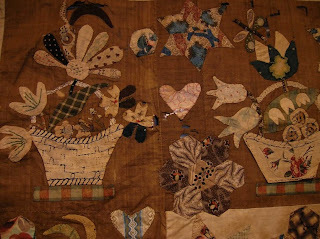 Wonderful quilts. I thought I read somewhere, that they used paper in quilts for added warmth? Thanks for the history lesson and the eye candy! I had heard that some folks left the papers in; and the four-poster shape is very intriguing, so Yankee-functional! Thanks for the link to Susi as well; her work is beautiful! Just scroll down a little. I also know who made it around 1835! Log Cabin- How Old is the Name?